17G, Jalan Mutiara Subang 1, Taman Mutiara Subang, 47500 Subang, Selangor, Malaysia. 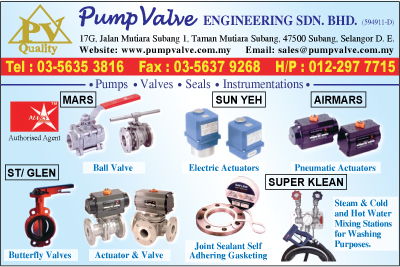 PumpValve Engineering established in 2002 with the intended purpose of providing a complete line of ISO 9001 certified, high quality ball valves for variety of industry application. pressure & temperature instrumentation, bronze steam & cold water mixing unit-duramix, bag filtration system, ABS/stainless steel/carbon steel/galvanize iron/copper pipes and fittings. We can also be constructed to meet your specific application challenges. Our customer range includes oil and gas company, oleo & refinery plant, chemical plant, food & beverage plant, water & waste water treatment plant, engineering consultant and trading company. To keep up with industry demand, we continuously add new products, concentrating our efforts on high quality products. Quality is our commitment, and our customers are in the center of our operations.